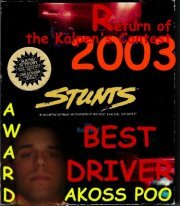 Hello and be welcomed to the Stunts competition site! The whole competition consists of five contest tracks following each other throughout the year and to be raced within six weeks. Just download the competition track here, take your Stunts 1.0, Stunts 1.1 or 4D Sports Driving 1.1, choose the car you like best and then *R*A*C*E*!!! Please save your replay (it must be valid; e.g. you must get to the Stunts scoreboard with a valid time) and send it to us. We'll check our e-mails and update the scoreboard as soon as we watched and validated the replays. You lost the remote frame on the left? You are caught in another one's frame?